Floating wetlands may seem odd but are perfectly natural. They occur when mats of vegetation break free from the shore of a body of water. That got ecological engineers curious about how they affect the water they bob up and down in. A group from Saint Francis University in Pennsylvania and the University of Oklahoma, including researcher William Strosnider, has found that the floating wetlands show promise for water treatment. They engineered four different floating treatment wetlands designs using different materials and wetland plants. "The main result is that engineered floating treatment wetlands could affect water quality in many of the same ways that naturally-occurring floating wetlands do," Strosnider says. For the four designs, the researchers used materials such as drainpipe, burlap, mulch, utility netting, and reused plastic bottles. They planted them with two wetland plants, cattail and common rush. The team then spent three years measuring the effect of the floating wetlands on the water. Fully treating wastewater requires processing the nitrogen it contains. Strosnider's study shows that these floating wetlands may be able to do this. The study did not directly investigate the processes that allow the wetlands to affect the water. However, they believe it's a combination of different factors. The plants themselves could be taking up some contaminants in the water, he says, but microbes may have the biggest effect. The base and roots of the floating wetlands make a great place for microbes like bacteria to thrive. There they carry out processes that break down or absorb pollutants such as nitrogen and phosphorus in the water. 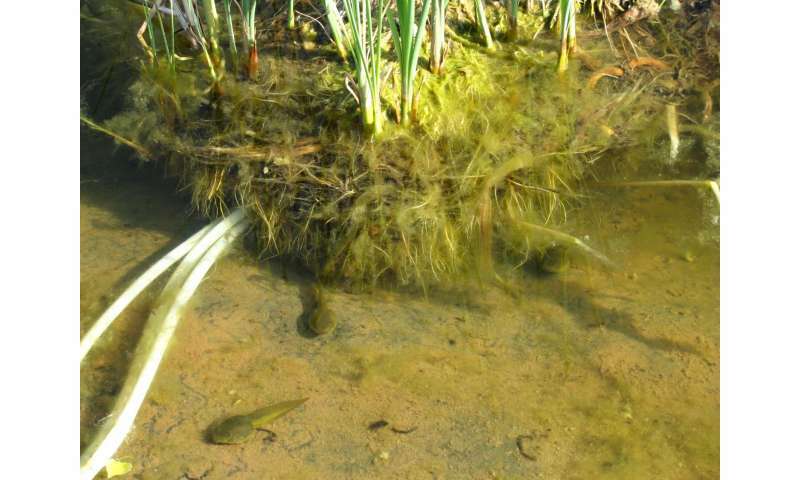 In the floating treatment wetlands, tadpoles tended to aggregate in and around the root zone. Credit: Kristina Strosnider. 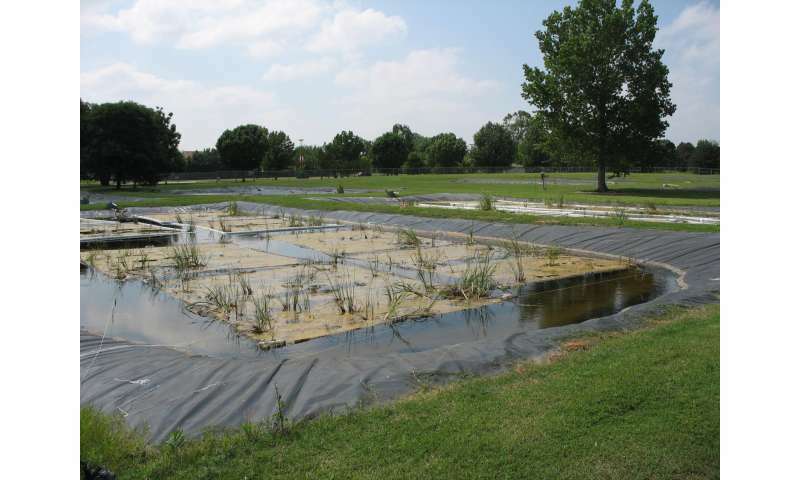 There are many examples where these floating treatment wetlands could be successful. They could help treat municipal wastewater by enhancing nitrogen removal. In another example, they could manage algal blooms by helping to regulate water temperature and solar radiation. Algal blooms are a difficult issue for drinking water reservoirs and coastal ponds. Algae can clog water filters as well as result in lower levels of oxygen in the water, which can kill fish. To Strosnider, the most interesting thing about the engineered floating treatment wetlands is their ability to do more than improve water quality. They can also provide habitat for fish below the water and insects, water birds, and others above the water. "The area directly beneath the floating wetlands is high quality habitat, as small fish and amphibians can use the maze of roots to hide from predators," he explains. "In general, the value of habitat that floating wetlands, or any type of treatment wetland, can provide has been poorly studied. We took a small step forward with our study." Strosnider notes that it could take relatively high-coverage floating treatment wetlands to drive these positive effects. This means that they must continue their research on how best to construct the engineered wetlands and which plants will grow best on them. Getting the floating treatment wetlands to sustain themselves with minimal maintenance is the main goal of this research, he says. Rather than "intensive" floating wetlands that rely on plastics or styrofoam to function, Strosnider stresses research on "extensive" wetlands that can grow and remain floating all by themselves. "The next step is to take the lessons learned and test improved extensive designs," he says. "The really big thing that we're working on here is the ability for them to grow and maintain themselves, and hence become a sustainable low-maintenance part of a treatment system. That really was the most interesting and novel part of this work."